By Bill Phanco: 48-year-old Bernard Hopkins defeated IBF light heavyweight champion Tavoris Cloud by a 12 round unanimous decision to capture his IBF title at the at the Barclays Center, in Brooklyn, New York, USA. The final judges’ scores were 116-112, 117-111, 116-112. Undefeated welterweight Keith Thurman (20-0, 18 KO’s) put in an impressive power punching display in pounding out a nice 12 round unanimous decision on against #1 WBO Jan Zaveck (32-2, 18 KO’s) in an WBO title eliminator bout. The victory locks Thurman in as the mandatory challenger for WBO 147 lb. champion Tim Bradley. The judges scored the fight 120-108, 120-108, 120-108. Thurman kept a constant flow of power shots raining down ont he shorter Zaveck through the full 12 rounds. However, Zaveck showed a great chin, as he took an awful lot of big punches from the hard hitting Thurman. It’s hard to imagine many other welterweights taking those kinds of shots without going down for the count. Zaveck didn’t throw a lot of punches in the fight, as he mostly trying to keep from getting hit by Thurman. It proved almost impossible to avoid Thurman’s constant flow of shots. However, Zaveck did discover late in the fight that Thurman’s power wasn’t nearly as dangerous in close as it was at the distance. Zaveck stayed close to Thurman in the last four rounds, and he didn’t take nearly as much punishment than he had early in the fight. Bradley will likely use the blueprint that Zaveck created in how to nullify Thurman’s power by staying close to him at all times, and forcing him to fight on the inside. 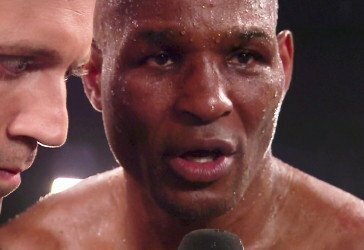 Next boxing news: Ageless warrior Bernard Hopkins does it again!